Sometimes you are working with a text or part of the text that you want to sort. Maybe someone else has added a list to a text document and you want to sort it to get a better overview, or you have downloaded a text document with client information and you want to sort the data. WinSorter is a handy portable application for Windows that can do that right in the text editor the text has been opened in. It works with all kinds of text that is currently open on the system, regardless of the editor used. The program can for instance be used to sort selected text in Word documents but also plain text files. The principle is always the same. First, the text that needs to be sorted has to be highlighted before one of the available actions is selected from WinSorter's system tray menu. 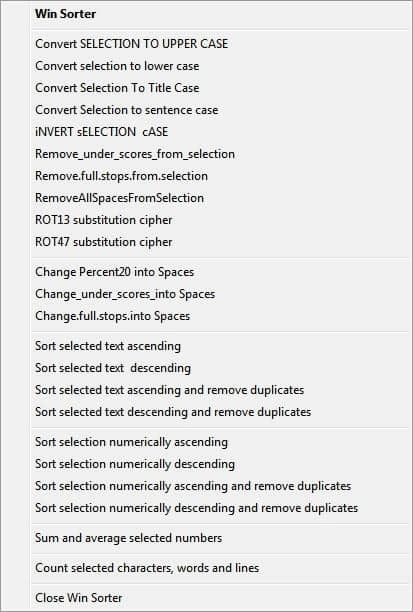 Available options range from sorting selected text with our without removing duplicates, removing characters like full stops, underscores or spaces from the selected text, changing characters like underscores into spaces or converting the selection to upper, lower, title or sentence case. There is also an option to count the selected characters, words and lines and to sum and average the selected numbers. WinSorter is a lightweight application that's compatible with the majority of text editors. It does not work in some browsers like the web browser Firefox or the email client Thunderbird. The software program is compatible with 32-bit and 64-bit editions of the Windows operating system. A download is offered at the developer website. Check it yourself…Can you confirm it’s a false positive? Since the software is made with Autohotkey the likelihood of a false positive is very high. But, you should probably submit the file to Prevx to get a definite answer. How do you do that?! I heard about Prevx but neved used it. Is the ROT13 and ROT47 suitable for use with Geocaching? Nice find, quite a gem.